Archeologists disagreed during the last session of a three-day conference held in Egypt, to discuss Tutankhamun and his treasured funerary collection, on whether the king’s tomb contains a hidden chamber holding the final resting place of Queen Nefertiti. The final session involved a scientific discussion forum on the latest results of recent radar scan surveys carried out on the boy-king’s tomb in Luxor in an attempt to uncover any existing hidden chambers by using non-invasive methods. The radar surveys aim to test a theory put forward last August by British Egyptologist Nicholas Reeves, who claimed that the tomb hid the burial place of Queen Nefertiti. Former minister of antiquities Mamdouh Eldamaty supported the theory and the survey mission, saying that more radar scans from the top of the tomb should be carried out in order to reach the accurate results. However, former antiquities minister Zahi Hawass rejected the theory, asserting that nothing lay beyond the burial chamber in the boy-king’s tomb. He also raised doubts over whether radar scans can be used to make archaeological discoveries. “In my entire career, I have never come across any discovery in Egypt made by radar scans,” he said. Hawass suggests that in order to test the accuracy of the radar, scans should be carried out on tombs that are already known to contain hidden chambers, such as King Ramses II’s tomb, which has 10 sealed chambers. Reeves defended his theory by stating that preliminary results of several scans suggest that two void spaces exist behind the north and west walls of the tomb’s burial chamber and show signs of metal matter. Most of the scholars and Egyptologists who attended the conference rejected Reeves’ theory, saying it has no basis in reality. Director of the Egyptian Museum and Papyri in Berlin Friederike Seyfried, who does not believe that Tutankhamun’s burial chamber conceals any hidden chambers, told Ahram Online that the results of the radar survey do not prove the existence of a hidden tomb. She describes Reeves’ claim that the tomb of Nefertiti lies behind the northern wall of the burial chamber as a mere hypothesis. She rejected Reeves’ claim that a scene depicted on a wall within the tomb shows Tutankhamun performing the “opening of the mouth” ritual for Nefertiti, saying that an inscription shows that it is in fact King Iy who is performing the ritual for Tutankhamun. “I believe that the ancient Egyptian artist would never make a depiction of the pharaoh without a direct inscription beside [the image],” Seyfried said. 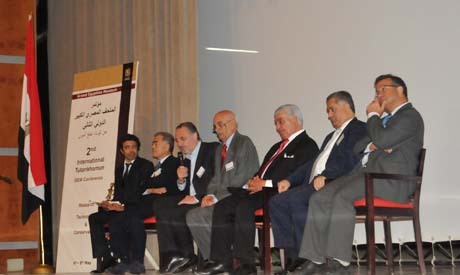 Antiquities minister Khaled El-Enany asserted that the conference shows that science is a priority and “we are not against any scientific project,” adding that the scientific endeavour would ultimately reveal the truth. “The scans of the tomb will continue in line with the scholars' recommendations, but no physical exploration will be allowed unless there is 100 percent certainty that there is a cavity behind the wall,” El-Enany concludes. Doesn't Zahi Hawass know a prelim test was already done on KV5? According to your article "Radar test underway before search for Nefertiti in tomb of Tutankhamunon" dated November 26 2015, the preliminary test on KV5 was a success. Minister of Antiquities Mamdouh Eldamaty was quoted in the article as saying "Thank God all the results given by the radar are correct." This can be quickly solved by SLOWLY drilling a small hole in an unobtrusive area and sending in a fibre optic camera. Such cameras can be as small as 1mm, so the "damage" would be minimal. (Zahi did far, far worse on the Great Pyramid, so he should not object.) Using such a small camera would not actually show much, but at least we'd know if there was a chamber or not. Looks like religion and politics strike again. Sounds like local obstructionism as a prelude to handing over the plunder to "private interests".